Partnership Business Forms. Legally Binding. Lawyer Drafted. A partnership is a relationship existing between two or more persons who join together to carry on a trade or business. Each partner contributes money, property, labor, and/or skill to the partnership and, in return, expects to share in the profits or losses of the business. For a business in which two or more people desire to share in the work and in the profits, a partnership is often the structure chosen. It is, potentially, a much simpler form of business organization than the corporate form. Less start-up costs are necessary and there is limited regulation of partnerships. A partnership is usually based on a partnership agreement of some type, although the agreement need not be a formal document. The agreement itself can be immensely useful in spelling out how new businesses will be run under the agreement. Issues ranging from capital contributions to how buy-outs are conducted are all covered under the umbrella of a partnership contract. Employee Partnership Agreements An agreement for use by a company or corporation who is admitting an employee as a partner. LLP Registration Kit This kit provides instructions and links for registering your business as a limited liability partnership. Letter of Intent and Term Sheet Limited Partnership This Letter of Intent and Term Sheet is for use by parties who have discussed entering into a limited partnership relationship. Partnership Amendment Kits Useful forms and guidelines to assist you in amending a partnership agreement. Partnership Registration Kit Forms and instructions for preparing the necessary paperwork and setting up a new partnership. Partnership Termination Kit Helpful forms and instructions to assist in terminating a partnership. Pre-Partnership Kits Useful tools for determining the details of a partnership's purpose, structure and governance prior to its formation. Sale of Partnership Interest This Offer to Purchase Partnership Interest is for use by one partner of a company to purchase another partner's interests. Subscription to Limited Partner Units This Subscription to Limited Partner Units contains two versions of this document and is for use when an individual purchases units in a limited partnership. Partnership Forms Combo Packages Get 7 forms for just $39.95. Save 65%! 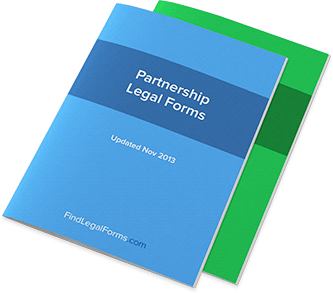 This form bundle contains our most popular and most useful Partnership Agreement forms. Take out the guesswork and save time, money and headaches by always having the right form at your disposal. Partnership agreements are sometimes the most crucial documents you’ll ever sign. If you launch a business at a young age with business partners and the business goes on to be a great success, that initial partnership agreement will help guide and mold your future – as well as the future of your relationship with the business partner. This can be a very positive thing, of course, but it can also have a great deal of negative consequences if there are problems. Unfortunately, bad partnership agreements can indeed sink companies and ruin relationships, so we at FindLegalForms.com think it’s a good idea to learn how so you can avoid these mistakes in the future. 1. The partnership agreement doesn’t make things equal. Even if both parties agree to a partnership agreement and sign it, an unequal partnership can cause a lot of strife if the terms aren’t specifically laid out. For example, if one partner has put more money into the company, the two parties might agree that each gets a different stake in the company. But if there’s an inequality in the partnership that is only hesitantly agreed to, that disparity can lead to business relationship problems down the road and almost certainly cause some legal strife. Make sure that the agreement is solid and ironclad before you both sign. 2. The partnership agreement won’t stand up in court. This is a major problem because it essentially means that the partnership agreement isn’t any good in terms of the law. Sure, it records what two or more business partners agreed to at a certain time, but if the partnership agreement is so poor that it doesn’t allow for legal action or won’t stand up in court, then it’s not going to accomplish a whole lot. An agreement that all business partners know will hold up in court has more power and weight to it – and often this power and weight is enough to avoid legal action altogether. 3. The partnership agreement doesn’t plan for the future. As a company grows, the legal infrastructure of the company had better make arrangements for that growth to allow legal flexibility – otherwise there could be trouble brewing. This is certainly the case for partnership agreements, wherein it’s vital that future money and finances are arranged for. Without these kinds of arrangements – such as 50/50 profit sharing – then there is hardly any legal basis for continued growth. 4. The partnership agreement doesn’t define company roles. Even if the partnership agreement has room for all of the above, it still had better define roles in the company so that there is a structure in place. Otherwise, two business partners can quibble over who gets command and control over the company because the entire thing wasn’t spelled out in the initial partnership agreement. Two parties should have an agreement to these roles before they proceed. 5. The partnership agreement it too vague. There’s no point in signing a document that’s so vague that it essentially becomes worthless, and that’s especially true when it comes to partnership agreements. It’s better to download an ironclad partnership agreement from FindLegalForms.com. The reasons for getting out of a business partnership are vast; the right ways to do it are similarly complicated. But if you want to sell your partnership interest, it’s best that you at least have some understanding of what you’re getting yourself into. And if you’re still a little unsure about the process, it won’t hurt to find some advice that will help you navigate the road ahead. With that in mind, we’d like to offer three simple tips to keep in mind before you sell that interest. Tip #1: Consider all options first. If you’re unhappy with how the partnership is structured, you could ask for a company restructuring first. If you simply want to cash out, you might consider selling a partial amount of your ownership in order to retain some investment in the enterprise. The point is simple: if you haven’t considered all your options first, you might be missing a great opportunity to make a smart move. Tip #2: Review all of the paperwork before you announce your decision. If the reason you’re leaving a business partnership is because of problems with a business partner, then you’ll want to know where you stand before you make any decisions that could create an even greater rift. This is also true if you don’t have a bad relationship with your business partners and fellow investors. If you announce your intention to sell before knowing all of your rights, then you might leave yourself susceptible to the criticism of others, as well as potential legal strategies on their part that you hadn’t previously been aware of. You’ll want to know that you’re well within your rights to sell before you actually do, of course, but we take it even a step further: know everything you can before you even announce your intention. Tip #3: Ask your business partners for feedback or offer help. If you’re getting out of a company and you want to do it on good terms, then it will make you look a lot better if you consult them on the decision. Of course, the decision is ultimately yours, but if you tell them first, you’ll be likelier to keep their friendship and potentially their future business as well. You can also offer help to ease the transition of your departure. This will not only make sure that you’re leaving the business on a good note, but will make things easier on yourself as you sell your share of ownership. If you make sure to keep all of the above tips in mind before you announce your intention to sell, you’ll have a far greater likelihood of ending your business relationships well. Business partnerships can be a blessing or a curse. A good business partnership means that you’re going to support each other, help each other out, and pool your resources and skills to make sure that both of you become successful. A bad partnership can result in the dissolution of your company and the ultimate failure of your venture. Needless to say, partnerships have to be handled delicately. That’s why partnership agreements at the outset of a new business venture can be such a vital legal tool. When both partners define their roles within the venture, the resources they’re expected to pledge, and other definable details of their future relationship, there’s a real chance that having it all down on paper can really make the partnership happen smoothly. In any case, writing partnership agreements that result in happiness on both ends can really kick-start a new financial venture and send it in the right direction. Here’s what you need to know about partnership agreements to find a good one of your own. First, you’ll want to hash out a great amount of details with your partner before you put anything into writing. Why is this? Isn’t it good to put everything in writing right away? Well, you may find that when it’s time to put something in writing, you realize that you and your partner had a significantly different vision for what was going to happen in this new business venture. It’s better to find out about these differences before you invest too much into the relationship. Try to handle the big issues up front and you’ll find it’s easier to create a partnership agreement you can both live with. Next, remember that splitting money and profits equally is a great way to proceed. It can create difficulties for someone if they feel that they’re carrying a large part of the financial burden for a smaller portion of the rewards. If you’re entering a partnership knowing that one of the parties is going to handle a large part of the financial burden already, you can and should put this in writing anyway. When someone feels they’re entitled to more, you can always point out that they signed a partnership agreement saying otherwise. It’s also important that you get specific in your partnership agreement. If you don’t know how to divide up the profits, for example, then you’ll have to wrestle with that issue after the business venture has already lifted off from the ground - that’s not a time to deal with that issue. It can lead to rivalry, petty arguments, and generally a great deal of mistrust on both sides. That’s why you have to be specific about numbers - so there won’t be any room left for interpretation. If someone claims they thought they were signing something else, you should be able to point to the piece of paper you both signed and show them that they’re wrong. Assets: Everything a business owns, including amounts of money that are owed to the business. Paid-in capital: Total amount of money or property transferred to the limited liability company upon its beginning business. Partnership: An unincorporated business entity that is owed by two or more persons. Sole proprietorship: An unincorporated business entity in which one person owns the entire company. Working capital: The money available for immediate business operations. Current assets minus current liabilities.